Thank you all for your kind words about the loss of RB. His stablemate Fable is adjusting and has become even more fond of hanging out with the humans. 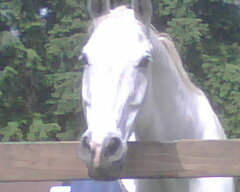 RB's owner has been looking for another companion of the equine variety, and I'm sure one will turn up soon. My own old kitty, Tal, passed on to the rainbow bridge last month, too. He was another senior citizen who led a full life. Although we are now cat-less, we still have the bunny and bird, and of course Eddie. Eddie is still on stall rest, but is doing well. He continues to be an excellent patient, and the last time his vet took x-rays he said the fracture was healing beautifully. 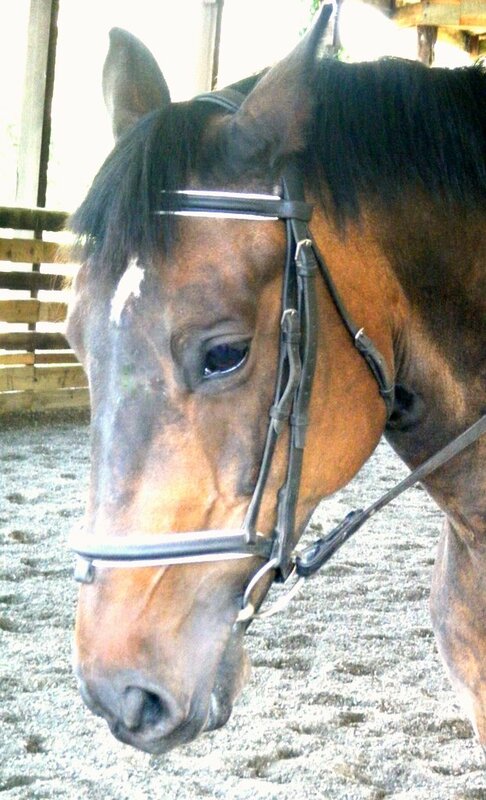 There's every chance he will recover and be able to go back to the dressage work we both love so much. He's now sporting a special shoe instead of a cast, and the places on his heals where the cast rubbed have also healed -- thanks in large part to Stacey, the stable's owner and my good friend. 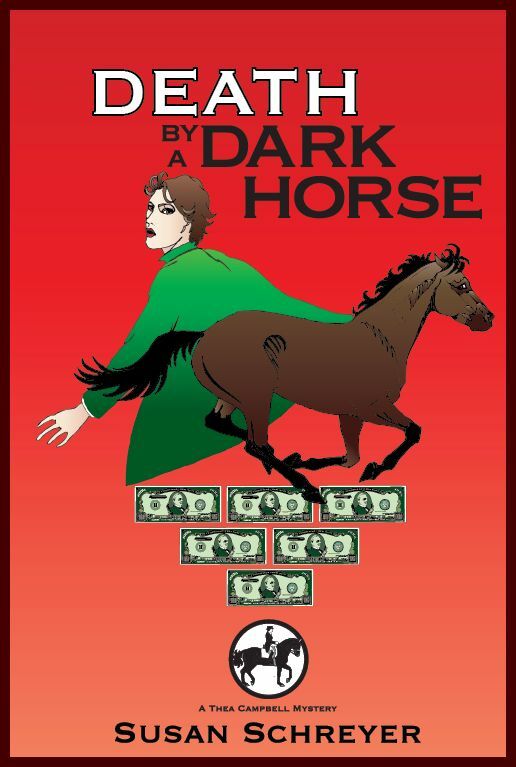 On the writing front, Death By A Dark Horse, has been doing well, and it made Amazon's Hot New Release List for both mysteries and women sleuths! That was a thrill! The list is updated hourly and it hung in on those list for well over a week! The Blog Tour de Force in January was a huge success as well as a lot of fun. It was work, and a bit confusing at times (from my end, anyway), but well worth it. I'm sure there are more than a couple new readers here who found their way from that tour. Welcome, to all of you! 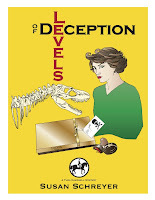 The second in my mystery series, Levels Of Deception will be out in e-book form this month. Phew! Edits are still being worked on, but I see light at the end of the tunnel. It's a longer book than DBADH, and takes place not only in Western Washington, but Montana, too. 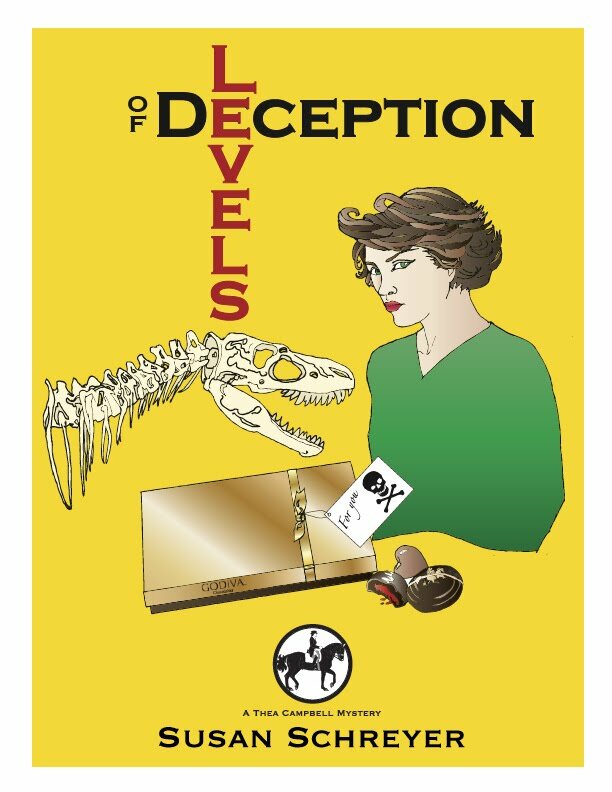 Stolen dinosaur fossils are the focus in this story, in addition to a murder -- all of which Thea must solve. For those of you who are Blackie fans, don't worry. He's there, too! So, what have my horses taught me to deal with this flurry of activity (you knew I was going here, right?)? Mostly, that no matter how orderly you strive to make your life, the unplanned and the unexpected will arise. In those times of need, if you pause for a moment to scratch someone else's back when they need it, you'll find they return the favor. I love the picture of your color-coordinated kingdom. So sweet. Sorry for your loss. Thank you, Nikki! They're all so perfect together :) And thank you for the sentiment. I wouldn't trade away all the wonderful memories for anything. They bring such joy every day! Welcome back, Susan. I, too, think that color-coordinated picture is priceless. How did you ever get them all three to stay still at the same time? Years ago I had eleven cats at one time. My daugther and I took them all to the vet's office where a pet photographer had offered a deal on pet pictures. The end result was funnier than heck, with one cat sitting on my head, some on shoulders, and one diving off the front of the table. Maybe I'll blog about that. Could I use your picture if I give you full credit for it? Hi Fran, and thanks! It was a fairly easy picture to take, actually. 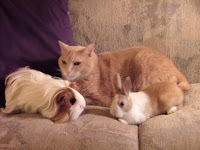 Tal wasn't inclinde to move from one of his favorite nap places, Jasmine (guinea pig) was the champion of sitting still, and Eclaire, was not inclined to hop off of furniture at that point, and liked being with friends. The kids used to dress Jasmine up in little costumes, put her in little dioramas, and take pictures! And yes, you can use the picture with credit. Send me your email at susan@susanschreyer.com and I'll send you the jpg.